I chose to carry up the yarn when changing colors instead of breaking the yarn and weaving in all those ends. Choose which method works best for you. 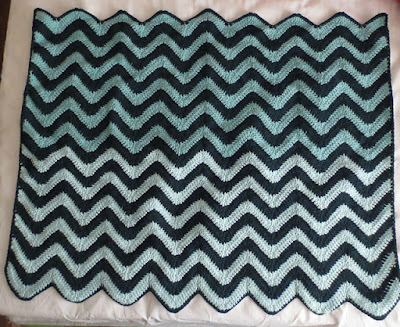 Gauge isn't super important with this blanket, but each chevron peak = 5 inches across and 3 inches from top of peak to base line (if a straight line had been drawn from tip to tip). -Yarn: I used 1 skein of Caron One Pound in Forest Green (Color B), 1/2 skein of Caron One Pound in each of Pale Green (Color A) and Soft Sage (Color C). Row 1: Skip 2 ch, work 2 dc in next ch, *1 dc in next 7 ch, dc3tog x 2, 1 dc in next 7 ch, 3 dc in next ch x 2. Repeat from * 6 more times. 1 dc in next 7 ch, dc3tog x 2, 1 dc in next 7 ch, 3 dc in next ch, ch 2, turn. Row 2: 2 dc in 1st st, *1 dc in next 7 sts, dc3tog x 2, 1 dc in next 7 sts, 3 dc in next st x 2. Repeat from * 6 more times. 1 dc in next 7 sts, dc3tog x 2, 1 dc in next 7 sts, 3 dc in top of turning chain, ch 2, turn. Repeat Row 2 until blanket is desired length alternating colors every 2 rows. If you are using 3 colors like I did, after the 6th Color B stripe, attach Color C and continue alternating every 2 rows. Bind off and weave in ends. If you are doing the border, you don't have to break the Color B yarn if you are okay with starting where it's located. Sc around entire blanket (using Color B). In the peaks and valleys, do the increases (3sc) and decreases (sc2tog). In the corners, do 2 sc sts. After going all the way around, join to 1st sc with a sl st, bind off and weave in end. multiple of 22 + 2 for those not able to watch the video and want to make different sizes. I am unclear about what the turning chain is at the end of the row, where you make 3 dc, chain 2, and turn. I am getting a weird edge on my blanket. I'm having the same issue. There is no way to make 3 dc before ch2. The 4th row gets lost and messed up w/o the 3 dc. How long did it take to make this blanket? I just wanted to say thank you for this pattern. I'm pretty new at this crochet thing and just learning to read patterns. Video tutorials are the best though, and yours is really well done! Thanks for taking the time to teach others! How long of a chain for a queen size and how much yarn? How many chains would I have to do for a single. Thank you for this video and pattern. 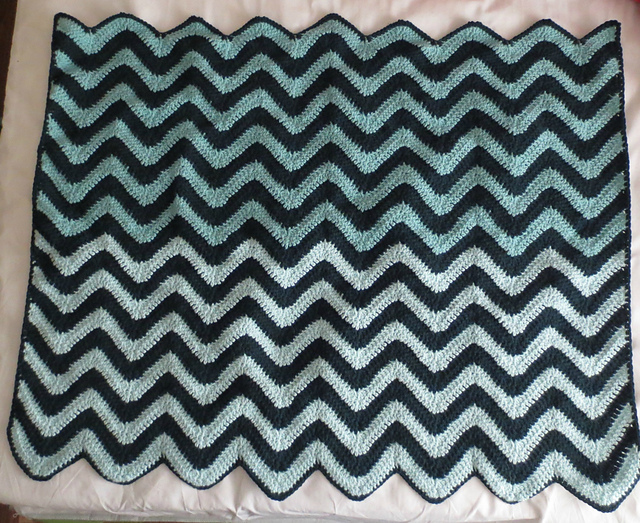 Before I started this blanket, my chevron pattern would come out wonky so I'd always give up. I'm 6 rows into a king size blanket and it has been perfect every row.